Sho: ...and she said, "You can even stay for free." What do you think? Yota: Can we get something to eat? I can't give advice on an empty stomach. Sho: OK. Let's go to the new hamburger shop near the station. Server: Are you ready to order? Yota: Yes. I'll have a hamburger and an orange juice, please. Sho: Can I have medium fries and an apple juice, please? Server: Sure. Just a moment. Yota: Make sure David doesn't stay at the Oasam Hotel. Keep him at your ryokan. Sho: Yota, have my fries. I'm not hungry anymore. Q: What did Yota order? 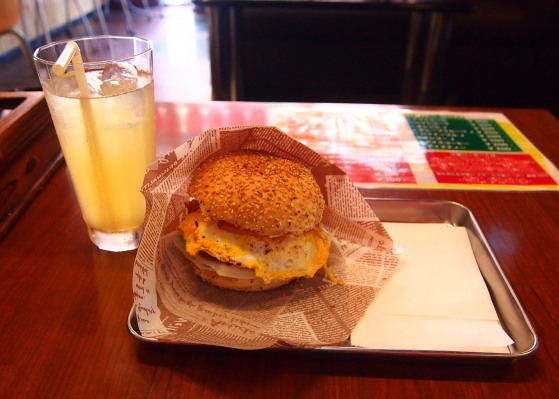 A: A hamburger and an orange juice. I'll have a hamburger and an orange juice, please. Can I have medium fries and an apple juice, please? ◆: I'll have a T-bone steak and a salad, please. ◆: Can we have a whole pizza and two large colas, please. I'll have a T-bone steak and a salad, please. （解答) I'll have three cheeseburgers and two medium coffees, please. I' ll have the spaghetti with meat sauce, please. 基礎英語3 Lesson 170 Perfect timing, Dad!